Yesterday I received a big package of new stamp sets, dies and stencils from Penny Black. It felt like another Birthday 🙂 With so many new goodies to play with, my mojo was at its best. I got to work with them the moment I saw them all. I LOVE the YOU & ME stamp set. Great set for making wedding and anniversary cards. 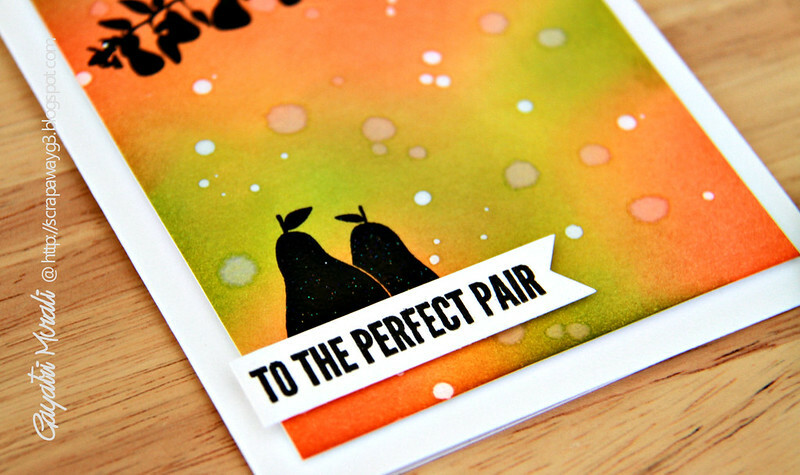 With the sentiments in the stamp set, you can make serious or punny wedding and anniversary cards. I love such versatile set. Here is the You & Me stamp set. I decided to use the pears and the pear branch images to make my card. 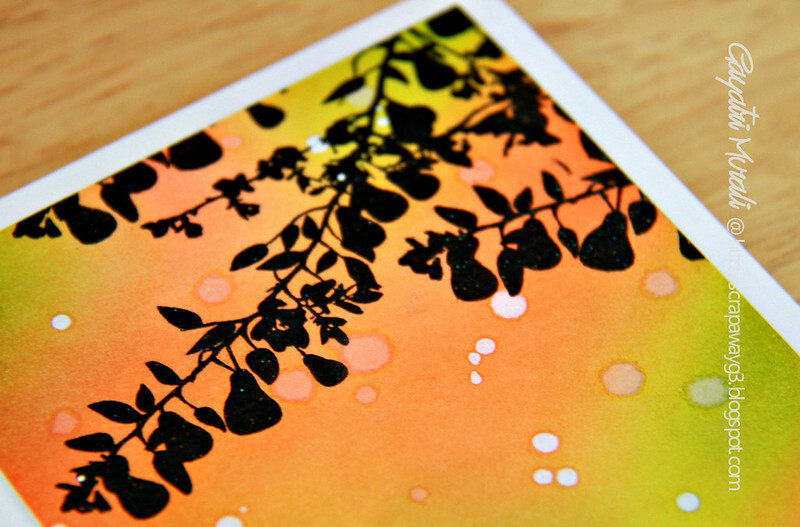 I wanted to use them as silhouette images yet have the pear colours on my card. This is my card. So I decided to sponge pear colours of green and orangish red on my card panel. Then I stamped the images on the panel using Versafine Black Ink and heat embossed them using clear embossing powder. Then I spattered some white Mr. Huey and plain water on the panel. The water reacts with the inks and gives a subtle spatter and white spatter stands out. 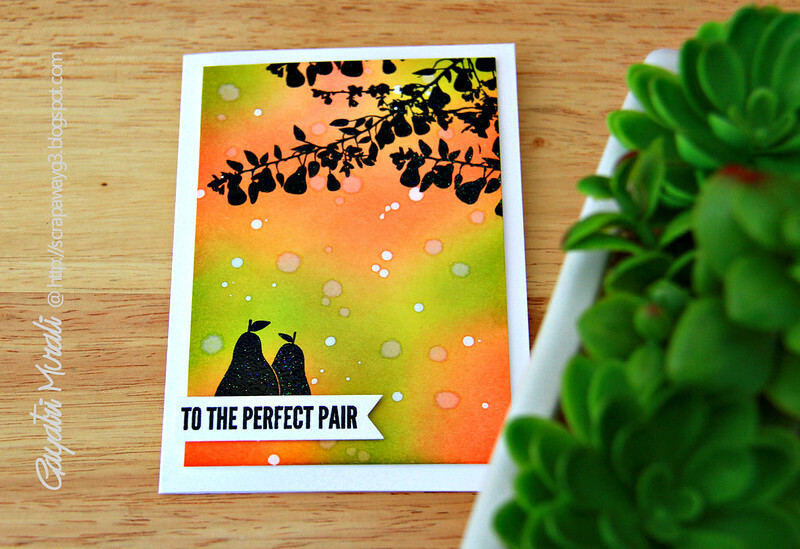 Love spatters on any card. I trimmed the panel and adhered on the white card base. The sentiment is simply stamped on a strip of white cardstock, trimmed and cut fish tail and adhered using foam adhesives as well. I am in love with this stamp set. One of my favourite in the Penny Black new release. You can see all the new release stamps, dies and stencils at Penny Black shop. Wow, Fab card ! loved the bg and the cute ” pair ” 🙂 ! Gorgeous background for the silhouette images! This is fabulous!! I adore your card, Gayatri! You are so creative! I also love Penny Black's silhouette stamps. What a gorgeous stamp set and card! Stunning…love how you've positioned the images against that truly gorgeous background.